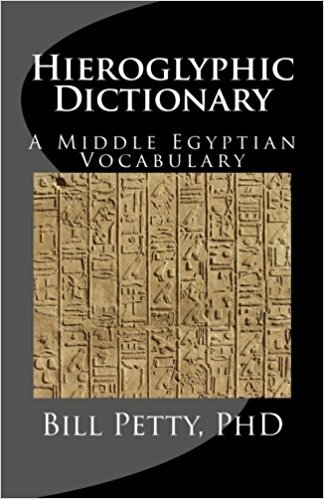 The Hieroglyphic Dictionary is part of Museum Tours’ series “The Essentials” ... books that anyone serious about the study of Egyptology will find useful. It has been created to fill a need for a low cost, yet comprehensive, translation aid to hieroglyphs that is convenient to use. Its emphasis is on words found in monumental inscriptions, as opposed to words found strictly in papyri. The words it contains are most likely to be encountered on the monuments in Egypt or in museums. It contains a about 4,000 entries. This compares favorably to the 2,500 entries in the vocabulary of Alan Gardiner's "Egyptian Grammar", and the 5,000 plus entries in Raymond Faulkner's "Dictionary of Middle Egyptian". The volume's convenient size makes it ideal for everyday use anywhere one happens to be, a local museum or the monuments in Egypt. It is a "must have" for any serious student, Egyptologist or Egyptophile. From Museum Tours Press.